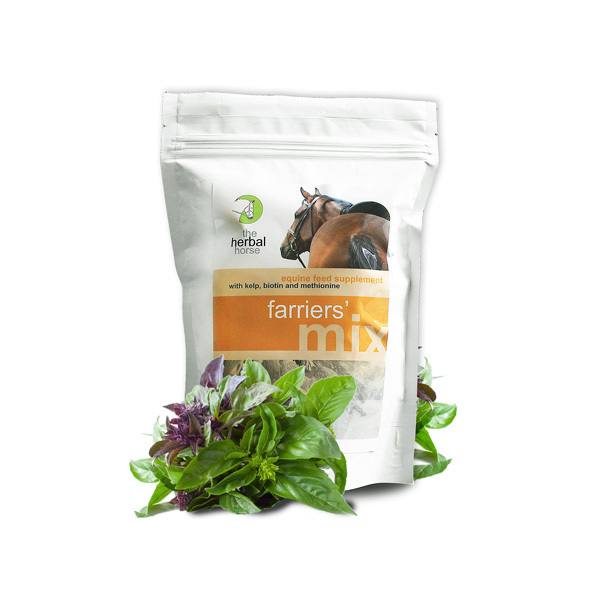 A blend of vitamins and minerals to support hoof care for horses by helping address nutritional imbalances that cause weak, brittle or sensitive hooves. Every month on the fourth week my horse used to lose a shoe. He was so lame he could not even walk in the camp… I would just start getting him going well and I wiould have to stop because he was as bad as crippled!! very frustrating! I have had him on farriers mix now for just over a year…. he hasnt lost a shoe in over 6 months!!! I used this product on a horse that had been returned from a lease with no feet. Poor thing could hardly stand, and people were saying he would never come sound. I tried the HH Farriers Mix and the farrier noticed the difference within 3 weeks, The horse was sound again within a month, and winning at eventing a couple of months later. Awesome stuff, and I am quite convinced that it saved my horse. On the recommendation of my farrier I put two of my horses on Farrier Mix, and both have responded well. The one is a very flat footed TB with slow hoof growth, although still flat footed, the farrier has hoof to work with now. My other TB’s hooves were a bit “soft” and always losing shoes, but hasn’t lost a show for ages. Excellent product, horses love it and it helps to build strong, healthy hooves.